The awards season just keeps getting better. After a host of awards, the latest were the annual Stardust Awards 2011, which was held on Sunday in Mumbai. After performing at the Filmfare Awards with Shah Rukh Khan recently, Madhuri Dixit returned to the stage, this time with Amitabh Bachchan in tow. Madhuri wasn't the only one who took the stage. Katrina Kaif, who had come in with her sister, performed her popular Sheila Ki Jawani number from Tees Maar Khan. In the picture: Hrithk Roshan and wife Susanne. Kajol, who recently won a Filmfare award for best actress for My Name is Khan, also took home a Stardust award for her performance in the same film. 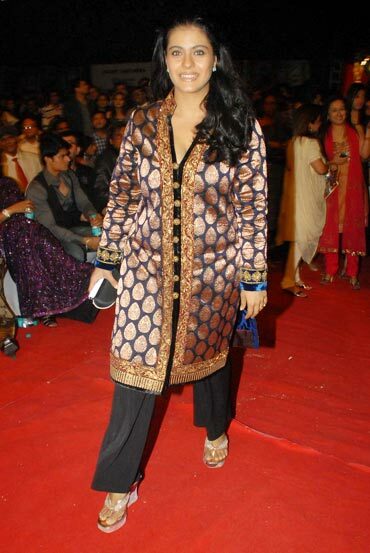 Another winner is Vidya Balan, who won for her performance in Ishqiya. The night also had its share of funny moments like this one of a shirtless Sonu Sood showing off his impressive pecs to filmmaker Sajid Khan. The winners' circle continued with Arjun Rampal who won for his role in Raajneeti. Celebrity couple Rishi Kapoor and Neetu Singh took home an award each for their work in Do Dooni Chaar.